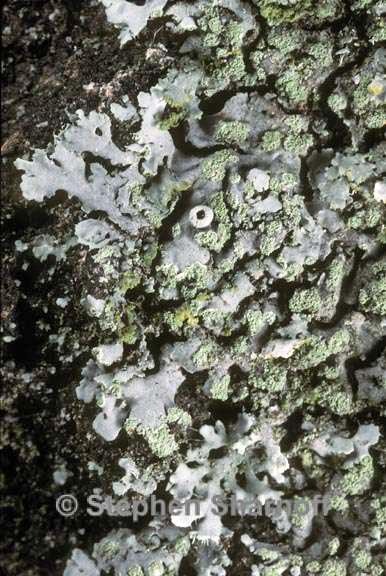 Thallus: foliose, up to 3 or 4 cm in diam., +orbicular lobes: elongate and discrete to somewhat irregularly rounded and partly imbricate, 0.5-1.5(-2) mm broad, +flat, prostrate or weakly ascending upper surface: gray-white to brownish gray, epruinose, sorediate soredia: granular, in primarily laminal soralia which are rounded to somewhat irregular, a few submarginal soralia also developing upper cortex: paraplectenchymatous medulla: white lower cortex: prosoplectenchymatous lower surface: white to pale tan, dull or weakly shiny; rhizines: simple, concolorous with the lower surface, rather sparse Apothecia: occasional (not seen from the study area), up to 2 mm in diam., sessile to very short stipitate; margin: entire to weakly crenate or rarely sorediate ascospores: brown, 1-septate, ellipsoid, (14-)16-21(-24) x (6-)7-10 µm, Physcia-type Spot tests: cortex and medulla all spot tests negative Secondary products: none detected. Substrate and ecology: bark, less often on rock World distribution: North America and Asia Sonoran distribution: uncommon in Arizona, and Sonora. Notes: Physciella melanchra is closely related to P. chloantha and when the latter species has unusually numerous laminal soralia, the two may be confused. Normally, the labriform soralia of P. chloantha clearly outnumber the laminal soralia, and although P. melanchra may have some submarginal/marginal soralia, they are not distinctly labriform.